I once failed a French class. Speaking French didn’t come easily to me, and I truly didn’t commit to the language. Enough said. You know what’s easy to commit to? 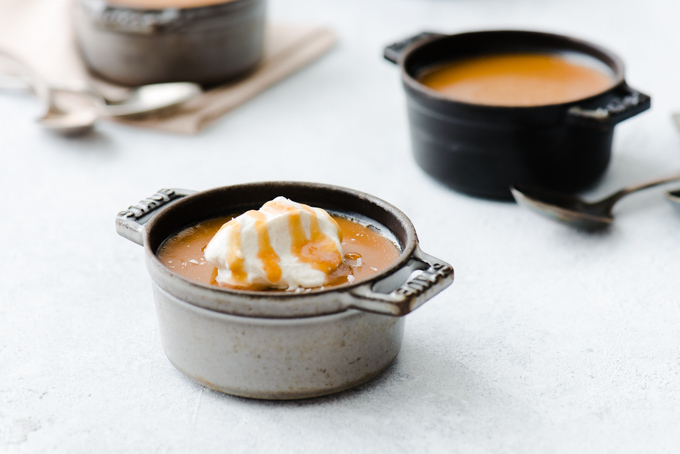 These creamy, indulgent, pots de crème. I would highly recommend it. Ils sont délicieux. (They’re delicious.) I’m not going to France anytime soon, but thanks to Gjelina’s stunning cookbook, I was able to bring myself and some friends along to have a taste of France. This post dates back to a few weeks ago, when my friend Lauren came to visit from Calgary. She mentioned she was a vegetarian, and hoped it wouldn’t be any trouble. Not at all! We kept ourselves busy few a few days eating everything in sight – veggie burgers from Ayden Kitchen & Bar, veggie spring rolls at Odd Couple in Saskatoon, and a vegetarian feast at home with our roommate Nathan and his girlfriend Karyn. (Lauren remarked it might’ve been the best meal of her life.) Possibly the best thing about having vegetarian friends is my sneaky ability to direct attention to something designed for vegetarians – dessert. Our meal was stunning, and these pots de crème were hardly necessary, but oh so delicious. I’m so glad we made them. The flaky sea salt contrasted perfectly with a smooth, butterscotch flavor and nicely weighty consistency. 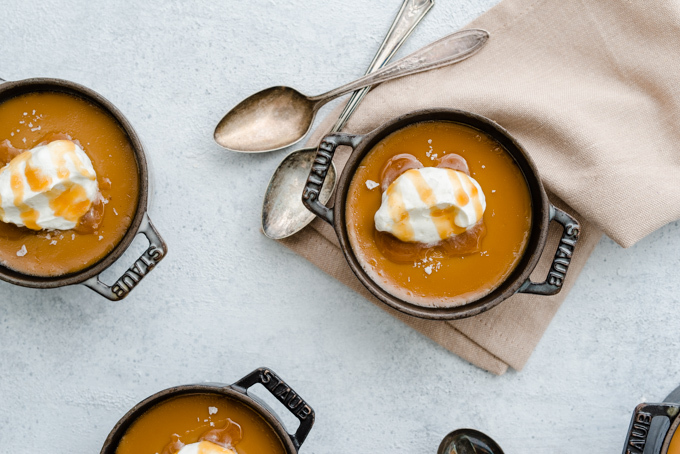 Sweet caramel custard served with a sprinkle of flaky sea salt make for a highly addictive dessert! Place eight ramekins (3/4 cup capacity) in a baking pan with a high edge. Separate 9 egg yolks into a large bowl, set aside. In a medium saucepan, cook brown sugar and butter on medium heat without stirring, until the brown sugar becomes a deep amber color, and develops a nutty smell, about 10-15 minutes. Slowly pour heavy cream into sugar mixture, constantly whisking. Once cream is whisked in, remove from heat. Add kosher salt, seeds scraped from vanilla bean. Stir until combined. Slowly pour the butterscotch mixture into the egg yolks, whisking constantly. Once combined, strain custard through a fine mesh strainer, into a large measuring cup or bowl with a pouring edge. 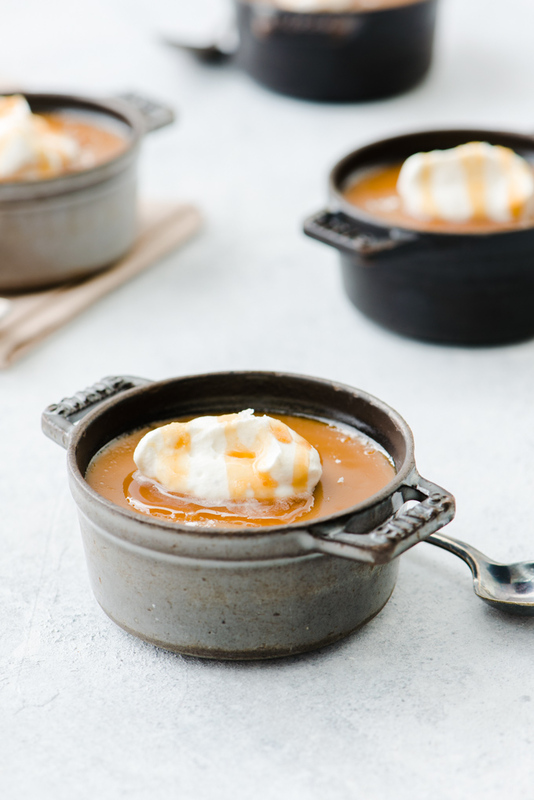 Divide butterscotch evenly amongst the 8 ramekins, and pour hot water into the baking pan until it reaches half-way up the edge of the ramekins. Cover with aluminum foil and bake for 45 minutes, rotate the pan and bake 15 minutes longer. Once removed from the oven, place the ramekins on a cooling rack. The custards will be slightly jiggly, but will set more as they cool. Once cooled, serve, or store in the fridge until ready to use (let custards come to room temperature before serving). 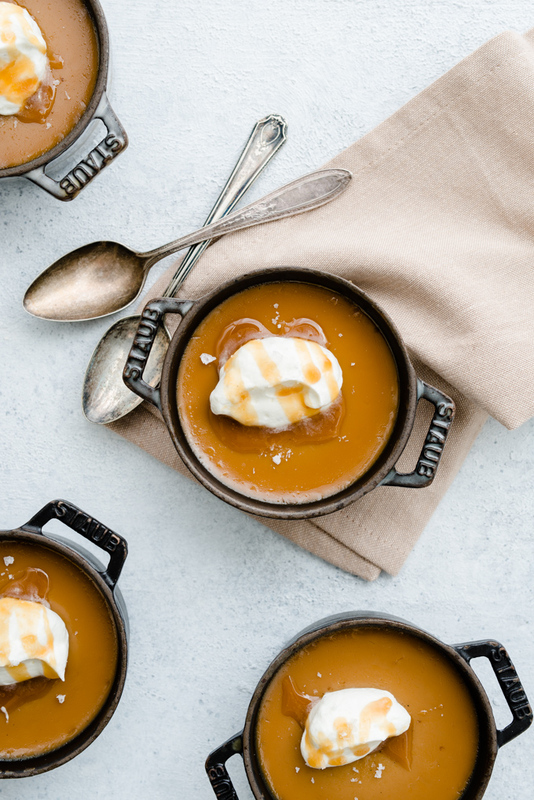 Top with whipped cream, a drizzle of caramel sauce, and a sprinkle of flaky sea salt. Pots de Creme will keep in the fridge for about 1 week. Recipe adapted from the Gjelina Cookbook. One day I’ll tackle sourdough on the blog! While the recipe for it is relatively simple, there are a ton of variables that go into making sourdough bread, and although i’ve gotten pretty good at it, I still feel like there is more to know. When the time comes, it will be a very comprehensive post! If you are interested in making sourdough, I would strongly recommend visiting https://www.theperfectloaf.com. It’s an extremely thorough blog dedicated to all the wonders of sourdough.